A German banker who alleges he was bribed by Bernie Ecclestone has testified for the first time at the corruption trial of the Formula 1 boss. Mr Ecclestone is accused of paying a bribe of $44m (£26m) to Gerhard Gribkowsky to secure the sale of a stake in the F1 business to a company he favoured. He admits paying Gribkowsky but says he was blackmailed into it. The banker is serving eight-and-a-half years for receiving the payment. In the first of what is expected to be four days of evidence, Gribkowsky apparently failed to explain why the F1 boss paid him the money. Mr Ecclestone, who has pleaded not guilty, faces a maximum prison sentence of 10 years if he is found guilty. The 83-year-old says he was effectively the victim of blackmail as the banker had threatened to reveal false details about his tax affairs. But prosecutors at the court in Munich have contested this claim, saying Mr Ecclestone was never able to give firm details to back it up. The payments were made between July 2006 and December 2007. Prosecutors say Mr Ecclestone bribed Gribkowsky, who was on the board of Bayern Landesbank, to ensure that a stake in F1 was sold to a private equity group of Mr Ecclestone's choice. They allege that by securing the sale of the stake to a company Mr Ecclestone favoured, he would remain in charge of F1 and its commercial rights, broadcast payments and sponsorship deals. 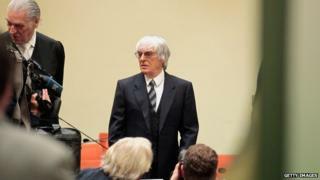 Mr Ecclestone has been following court proceedings through an interpreter. He has run motorsport for almost four decades, turning it into a huge global commercial success. He is the long-time commercial rights holder of F1, but sold off a majority of the ownership in the 1990s.